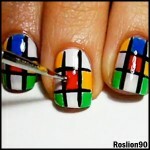 Our favourite Italian nail art blogger, Roslion90, has just posted a brilliantly geeky nail art how-to. 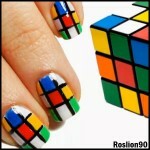 Really, there can’t be a nerd over the age of 28 who wouldn’t rather fancy Rubik’s Cube nails. 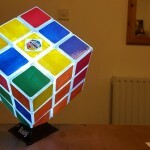 There’s a worrying chance that there are some nerds under the age of 28 who aren’t entirely sure what a Rubik’s Cube is and who can barely even remember the Rubik’s Magic. But I’m not going to think about that – it’ll just leave me depressed when I should be smiling about how lovely my Rubik’s Cube nail art is. 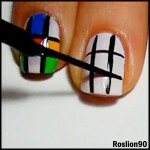 You’ll need a nail dotter and some very fine nail art brushes to make this nail art dream a reality. 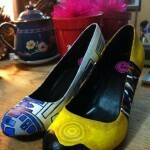 You’ll also need some bright coloured varnishes. This ORLY Instant Nail Art kit looks like it would work well.